FREMONT, CA – March 21st 2017 – CORSAIR®, a world leader in enthusiast memory, high-performance gaming hardware and PC components, today announced the immediate availability of CORSAIR VENGEANCE RGB DDR4 memory. 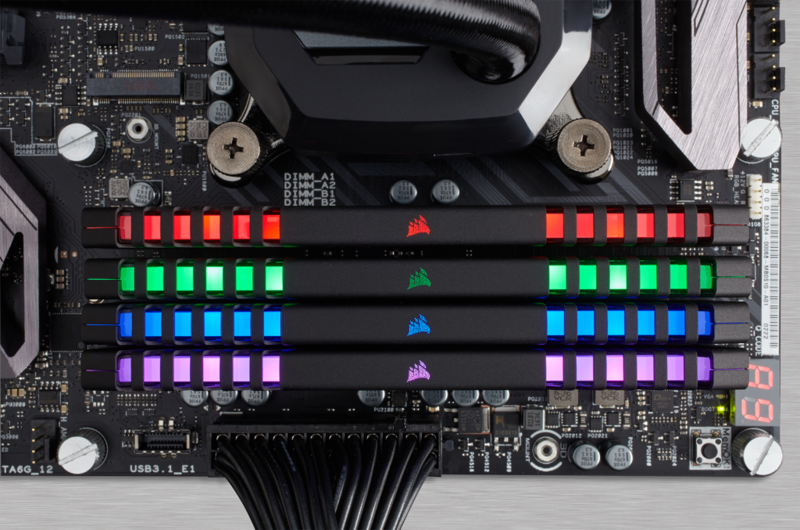 VENGEANCE RGB brings vibrant RGB lighting to the DIMM slot, with high luminosity RGB LEDs integrated into every module, all controlled by CORSAIR LINK. CORSAIR VENGEANCE RGB’s wire-free integration enables software RGB lighting control without additional wires (patent pending) for a sharp, clean look and providing an instant visual upgrade to any system build. Equipped with a precision-engineered light bar and an all-new perforated CORSAIR logo, each LED generates vibrant and rich RGB lighting. With four customizable lighting modes; static, rainbow, breathing and color shift, it’s simple to color match your system’s build or put on a dazzling light show, and with specifically designed lighting circuitry, there’s zero impact on DDR4 performance. With CORSAIR LINK, users can set up a temperature alert that automatically changes each memory module’s LED color based on system temperatures, as well as monitor and control a wide variety of CORSAIR components, from case fans, lighting, DRAM and compatible CORSAIR power supplies to Hydro Series liquid CPU coolers, providing a complete PC monitoring experience. VENGEANCE RGB’s built-in heat spreader doesn’t just look great, it keeps each memory module cool to maintain performance and stability under high load operations. Using a custom performance PCB and carefully hand-screened ICs, VENGEANCE RGB guarantees better signalling and superior overlocking potential. 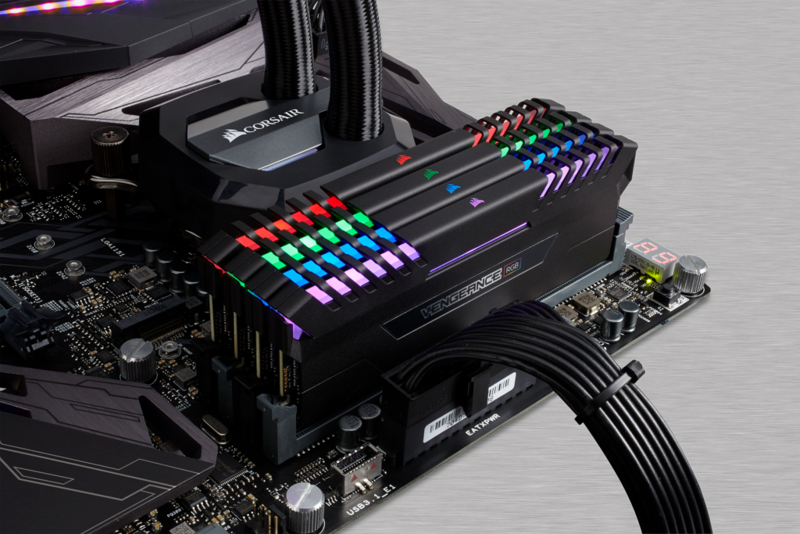 VENGEANCE RGB’s XMP 2.0 support makes overclocking simple and easy for novices or seasoned PC builders, allowing users to safely switch between pre-configured tested Intel® XMP profiles and get the guaranteed performance out of their DRAM kit. 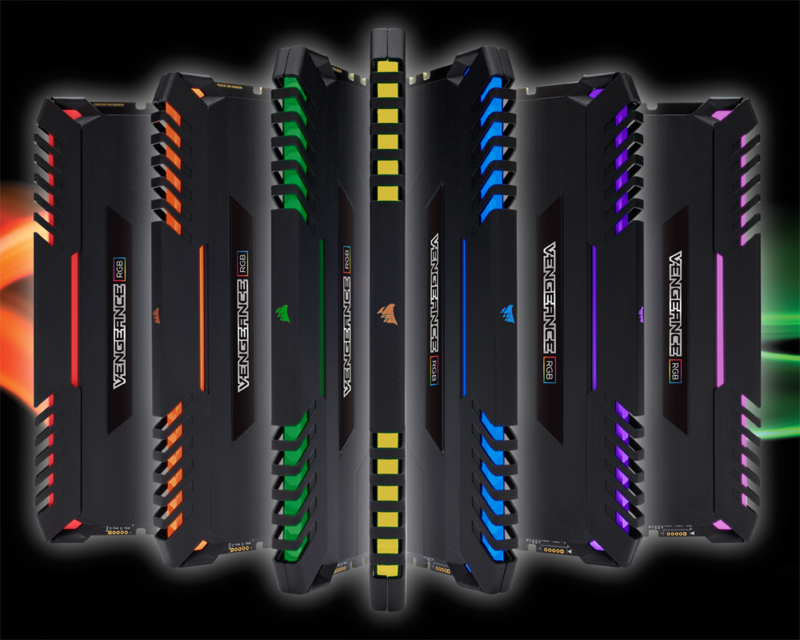 VENGEANCE RGB’s CORSAIR LINK software control is compatible with a wide range of Intel® DDR4 platforms, from dual-channel Z270 and Z170 to quad-channel X99*, with more boards adding compatibility every week and AMD Ryzen™ support planned soon. What’s more, VENGEANCE RGB is also compatible with third-party motherboard software RGB control, allowing users to synchronize DRAM and motherboard RGB lighting. Gigabyte is the first to offer VENGEANCE RGB support through its RGB Fusion App, with other motherboard partners coming soon. Please refer to www.corsair.com/vengeancergb for a complete list of VENGEANCE RGB compatible motherboards and software. CORSAIR’s first ever RGB DDR4 kits are available immediately in 16GB (2 x 8GB) and 32GB (4 x 8GB) 3000MHz kits, with additional capacity and frequency kits coming soon. 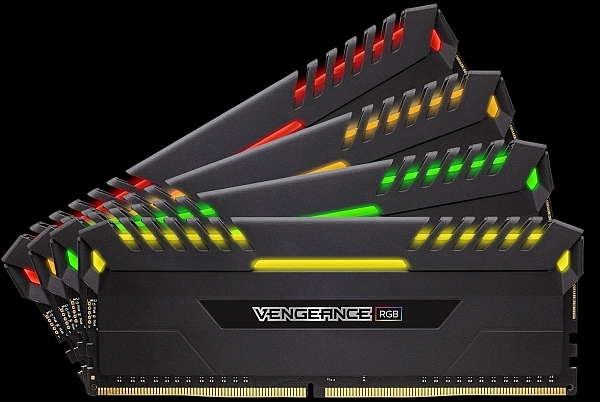 VENGEANCE RGB DDR4 is available immediately from the CORSAIR worldwide network of authorized retailers, and distributors and is backed by a lifetime limited warranty and the CORSAIR worldwide customer support network.